Home | Blog | Is a Storm Door Necessary? A storm door is an exterior door placed in front of the main door or a back door primarily as a protection against inclement weather, particularly in the winter, or to allow additional ventilation when the warmer weather comes. Many manufacturers build their storm doors so the glass fronts can be replaced by screen panels. It all depends upon the style you choose. In some cases, the glass panel is removed and the screen put in when warmer weather comes, and then the glass panel is replaced in the fall in preparation for winter. Other styles have built-in screens you can roll up or down. These built-in screens allow you to switch back and forth more easily so if you get the occasional warm day in winter, and you want to give your house a good airing, you can push the window panel up and pull the screen down. If you want to understand the purpose of the storm door, you need to think about your home’s building envelope — the physical separation of the conditioned environment inside your home and the unconditioned environment outside that is subject to the daily weather. This envelope protects your home from losing too much energy and against the weather. If someone leaves the front door open when they go outside, there is a gap in the building envelope. If your home is poorly insulated and heat or cold enter under deteriorated weatherstrips or around old windows, it is just like leaving the front door wide open. Even if your door has no particular problems with gaps or bad weather stripping, an older door can still drive down the temperature in your home through conduction. Conduction is when heat travels through some material to another place. Think of it this way — if the weather outside is particularly cold or windy, and the inside of your door is cold to the touch, that’s conduction. The insulation provided by a storm door can dramatically reduce this effect. A storm door is an efficient way to reduce losing energy in this way. A storm door acts as a barrier against bad weather and helps prevent cold or warm air from leaking into your house because of poor insulation in your main door. When the day outside is bright and sunny but the entryway to your home is dark and a little bit foreboding because of a solid door, a storm door is a great way to let more natural light into your home. This is especially true for homes with long foyers attached to the entryway. A storm door allows you to open the front door and get lots of bright sunshine into your home without creating a gap in the building envelope. This benefit goes together with the one above. When you either switch out your storm doors glass panel for the screen or roll down the built-in screen, you can let a lovely summer breeze into your home. This is especially great in the spring as the days grow warmer. After being closed up tight for the winter to prevent heat loss, there’s nothing like opening the windows and the door in your home and allowing a breeze to freshen the air in your home. Storm doors mean you can enjoy that wonderful fresh air without allowing insects or bugs in your home. Your entry door is frequently subjected to some harsh conditions. If you get a lot of rain, snow or wind, your door is buffeted regularly. If you have chosen an expensive, stylish front door to complement the architecture of your home, or even if you’ve just repainted your old one, you want your door to last as long as possible. A storm door protects your main entry door from everything nature can throw at it. You can reduce maintenance costs with a storm door, and it will most certainly help your main door last a lot longer. We mentioned your grandparents’ storm door above. In most cases, it was probably plain, painted white and made a loud noise when you open or closed it. The storm doors available today are incredibly different. They come in a variety of colors with striking glass designs and hardware that stands out from the crowd. A storm door can be designed to reflect your own personal style, meld perfectly with the design of the home and accentuate your entryway. Storm doors can provide your home with a stylish upgrade similar to what you might get from putting new windows in your home, but at a much lower cost. A storm door can dramatically lower your energy costs by helping to reduce conduction through your front door if it is old or lacks insulation. In some cases, storm doors can cut energy loss in half. Almost all storm doors come with solid key locks so no one can get in even if you’re not watching your front door. When your front door is closed, a locked storm door provides another level of security against anyone who might try to get into your home. The most critical factor to consider when you’re thinking about getting a storm door is the climate of your region. If you live in Ohio or Michigan, you can be subjected to everything from severe winter storms and torrential downpours to high winds. Exposing your main door to these elements can result in higher energy costs, a colder home and a door that looks old before its time. If you live in an area that gets quite hot, you might not want a storm door. The U.S. Department of Energy recommends against storm doors if your entry gets more than two or three hours of direct sunlight every day. In this case, the storm door can trap heat and may even damage your entry door. If you still want a storm door, consider one with low-emissive glass or vents. If you have a newer, energy-efficient, well-sealed front door, and your main concern is reducing energy loss, you may not need a storm door. Additionally, if your front entry is well-protected by a large overhang or covered porch, you might not need a storm door. Conversely, if you have an older door, a storm door can help you prevent heat loss, especially if you have a wooden door. Drafts around your entry door could be a sign that your door has warped over the years and no longer provides you with the insulation you need. Installing a storm door is much more economical than replacing a front door entirely. Storm doors come in a variety of styles and price ranges. If the idea of a stylish new front door is appealing, consider a quality storm door to improve the looks of your home as well as your home security and energy efficiency at a lower cost. 1. How Many Storm Doors Do You Need? Ask yourself if you want just one storm door for the main entrance or would like them on all the entrances to your home. 2. What Kind of Material Is Your Entry Door? As we noted above, if you have a wooden door, a storm door is a great idea. If your door is composed of material like aluminum or steel, especially newer doors that may be better insulated and more energy-efficient, you may not need a storm door. But if you have an aluminum or steel door that is not insulated, a storm door can provide you with better energy efficiency and keep the doors looking better for a longer period of time. 3. How Old Is Your Entry Door? The older your door, the more likely it is to have inadequate weatherstripping or be warped. Older wooden doors can also have cracks or nicks in them that aid the conduction process, transferring more cold inside your home. With almost all older doors, regardless of what materials were used in their construction, a storm door will help them better insulate your home and help them last longer. 4. What Are Your Heating and A/C Habits? If you already have many energy-efficient habits, such as keeping the thermostat around 68 degrees when you’re home or only using your air conditioning in the summer when you absolutely need it, you may not need a storm door as you may be doing enough already to keep your home energy-efficient. But many of us don’t pay enough attention to things like turning down the thermostat or turning all the lights off. Adding a storm door to the mix is an inexpensive way to help make up for these perfectly human foibles. Look around our site at the different kinds of storm doors that we have available. You’ll get a good idea of about what style and color may work best in your home. You can also ask a member of our team to help you make the selection. What type of view do you want to have in your glass door – full view, a middle view or a high view? 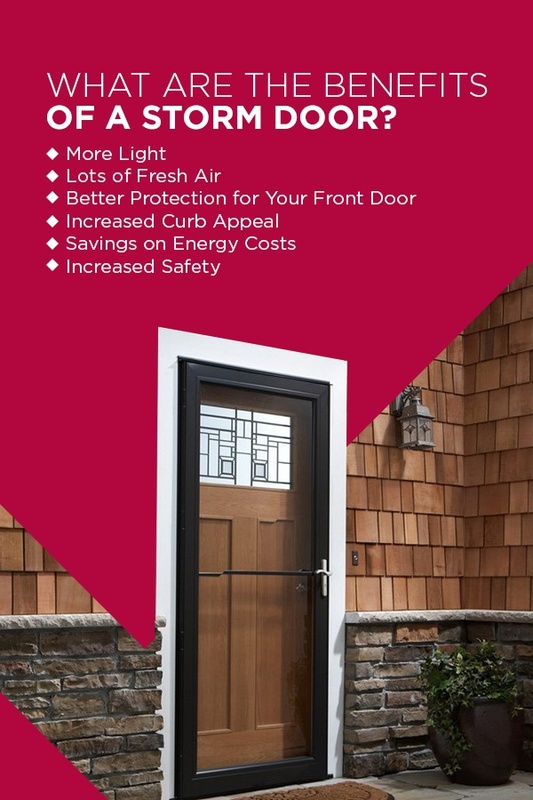 Do you want to buy a storm door that has a Low-E energy efficiency class? It provides great insulation as well as helping to reduce the fading of your main door. Check for tax credits. There may be tax credit available under your state’s energy efficiency program for installing a storm door. What color do you want? Do you want to door that stands out from the rest of your home or do you want something that blends in stylishly? Think about what type of screen you want to purchase. A full view storm door normally means you get separate glass and screen panels that you can switch out as the seasons change. Retractable screens can roll up or down. The standard screen always remains in place and you make use of it by sliding up the glass panel. What type of accessories would you like? You can buy handle sets in a variety of finishes like satin nickel, aged-bronze, brushed nickel or antique brass, to name a few. If you have questions about any of these factors, you can talk to us at Quality Overhead Door, and we will be glad to help you make your selections. Quality Overhead Door is a family-owned and -operated business that’s been serving the Toledo, Northwest Ohio and Southeastern Michigan areas since 1982. We care deeply about quality, which is why it’s part of our name. If you’re looking for a storm door, our team of experienced technicians will make sure you have the right door for your home. If you’re interested in finding out more information, you can call us at 419-578-8700 or drop by our showroom at 4655 South Ave in Toledo. You can also contact us online, and a member of our team will get back to you as soon as possible.